Being a coach for any sports team requires patience, determination and a lot of hard work. Coaching a children’s team demands all of this doubly! Children need not only a coach who can teach them how to play the game, but a figure to look up to as a mentor. For some young players, a coach may be the only positive adult role model they ever see. 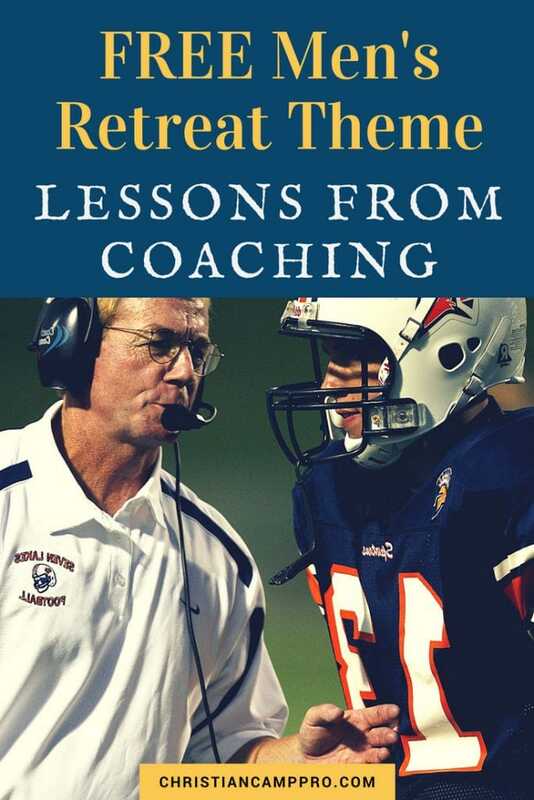 This Men’s Retreat Theme will focus on lessons from coaching to teach how important it is for coaches to be aware of not only the technical needs of his players but also the emotional and spiritual needs they may have. Young athletes need to know that while it is great to be a well-trained player, it’s even better to be a person of godly character. This goes for coaches as well! Use the scripture to remind coaches that having a team that cherishes biblical truth and represents Christ is better than having a championship-winning team. Practice makes perfect, but practice is not always fun. Players and coaches need to have discipline and a strong work ethic in order to perform at their very best. Training can be grueling, but it pays off in the end. Use the scripture to remind coaches that hard work in any aspect of life yields great rewards. Young players need to see coaches dedicating as much time to diligent practice as is expected of them. Team sports are challenging. Obstacles can seem overwhelming. Young players need to see a “Can-Do” attitude from their coaches. Coaches can serve as an inspiration to young players, giving them the courage and drive to keep pushing themselves further even when things are difficult. Like their young players, coaches can be overwhelmed by the challenges of team leadership. Use the scripture to inspire and encourage coaches to keep going despite the difficulties. This simple craft is perfect to hang in a coach’s office or in a training room. Simply provide pieces of pallet-wood and paints. Guests can use templates or stencils for the letters and shapes or even try free-hand. Use the Babe Ruth quote or any other quote or scripture verse for the wall hanging. These cool necklaces can be customized to fit almost any team sport. Supply each guest with nylon cord, washers, and paint and allow them to follow the step-by-step instructions for decorating and stringing the washer necklaces. No coach is complete without a trusty clipboard to keep track of the team roster, map out plays and make notes. Provide guests with a plain clipboard and let them customize them using the easy-to-follow instructions and some duct tape. This game is designed for kids but it makes a great activity for adults! Test your guests’ skills with dribbling a ball as well as listening and paying attention. Participants are lined up and given a ball. A retreat leader at the other end of the room acts as the coach and turns his back to the players and blows a whistle signaling that it’s time for them to start dribbling the balls. The players must try to dribble the ball to the other end of the room. The “coach” blows the whistle and turns around at various points in the game. At the sound of the whistle, the players must stop dribbling and stand perfectly still. Anyone caught moving is out! This game can work with other sports as well: basketball, hockey, even golf! Set up stations around your retreat space with sports-related tasks for each team to perform. For example, Station 1 can be a basketball challenge in which participants have to do a free-throw. Station 2 can be football toss in which participants must throw or kick the ball through a hole or over a goal post. The more stations the better. The first team to complete the relay wins. Give your guests a breather with this fun trivia game. Follow the instructions for constructing the game board. Create a category for several different types of sports. For example, one category could be Baseball Trivia and another could be Football Trivia. Divide your guests into teams and let them compete against one another to answer the most challenging sports trivia questions correctly. Set up your snack area as a Concession Stand complete with bagged chips, popcorn and cold water and soft drinks. Coaching kids and teens can be challenging. Sports team leaders have to be concerned with more than making the playoffs. They have a unique opportunity to make a positive impact on a child’s life that goes much further than the playing field. A Coaches retreat can help team leaders prepare for the challenges and keep an attitude of cooperation and dedication that can directly influence their young players for years to come.